The cross in memory of Bronnie Clarke (left) on West Coast Drive in Sorrento. LOUISE Clarke is turning the devastating and debilitating feeling of her daughter’s death into a confronting message she wants all teenagers to hear. Ms Clarke’s 22-year-old daughter Bronwyn (affectionately known as Bronnie) died from head injuries sustained during a motorbike accident on September 14, 2014. After a night out drinking, Bronnie got on the back of the motorbike a friend was driving before the fatal accident in Sorrento. 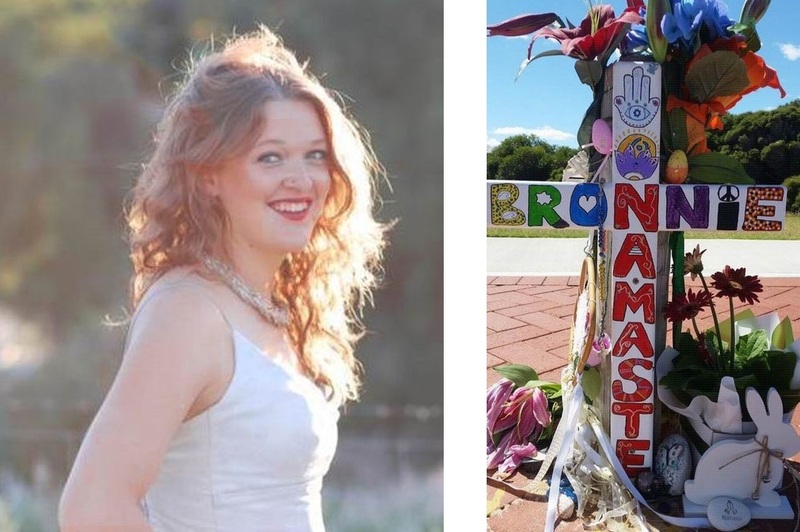 Bronnie died at the scene on West Coast Drive at the back of her former school, Sacred Heart College, where she’s remembered by a personalised cross representing her bright spirit. The Currambine mother-of-three said she remembered as if it was yesterday the call from a doctor that woke her about 5am the morning of the accident. “I was in manager mum mode and I asked how is she and where do I go to be with her, believing she was still alive, hanging on to that hope but dreading what the doctor would say next,” Ms Clarke said. “It was at that exact moment that my world came crashing down around me when the doctor’s reply was ‘I’m sorry to have to tell you that Bronwyn has been killed’. A year-and-a-half on, and as a way of channelling her grief and keeping Bronnie’s “beautiful spirit” alive, Ms Clarke speaks to Year 11 students about the ripple effect their actions have. “Bronnie created a negative ripple effect by that catastrophic decision of getting on the back of a motorbike,” she said. “When I go out to schools I talk about that negative effect and how it has affected her many loved ones. Bronnie’s immediate family took the direct hit like when the stone hits the water and subsequent to that the ripples that go out next hit her extended family, her close friends the next ripple etc. Ms Clarke has spoken at Sacred Heart College, Prendiville Catholic College and an RAC Be Street Smart event, with a presentation booked at Servite College in Tuart Hill later this year. She will also be speaking at Rotary’s Year 10 Youth Leadership Camp in May. The Prendiville teacher said she had one life and did not want it to be defined by Bronnie’s death but by making the negative ripple into a positive one and keeping her loving daughter’s memory alive. “The outpouring of grief is kind of therapeutic because you realise she made a difference,” Ms Clarke said. “It’s not such a senseless waste of her life if I can plant the seed and make a tiny little difference. To have Ms Clarke speak at a school, email her at lclarke@prendiville.wa.edu.au.